Step 2: Actually Prepare for Winter. Suddenly Commuting isn’t so Hard! The #1 essential you should always shoot for is a spectacular pair of lights. Lights are good to have through all seasons, but especially so when the days are darker and shorter. I usually carry one high quality, USB rechargeable set, and one cheaper, disposable battery set as a back-up. The higher quality lights will be on my bike, with the back-up set in my bag. Be sure to remove lights from your bike when you lock it up, as these tend to be thief-bait. My favorite lights in general, and that we carry in the shop, are by Light & Motion. 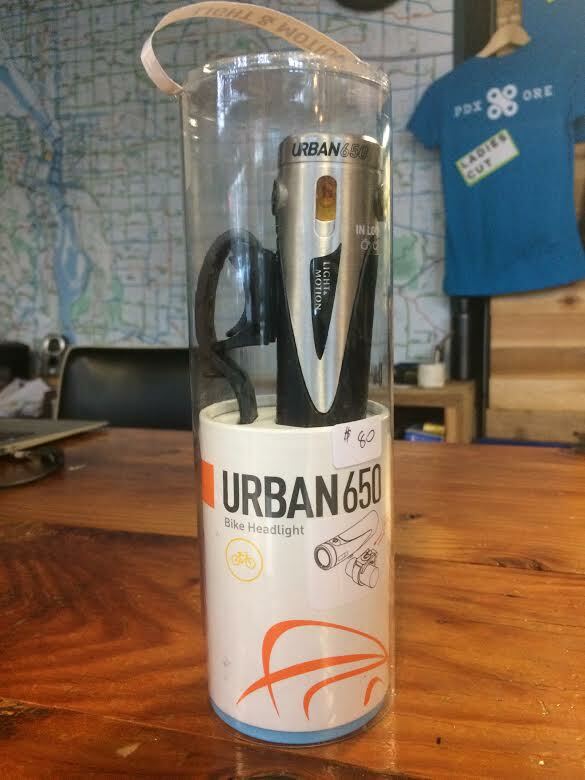 Pictured above is the Urban 650 at $80. I’ve had this light since I started commuting 5 years ago and it still works fantastically. Cheaper lights I’ve bought have had a much shorter lifespan. We carry a variety of Light & Motion lights up to 800. The Urban 350 is fantastic for city riding, especially if your commute is already lit. If you’re like me, and have very dark commutes with no lamps, the 650 is a good go-to. The first thing you want to do before you ride is check the weather report. What’s today’s high/low? What are the chances of precipitation by the hour? I like to think of “percent chance” of rain as actually being “percent volume”. But most telling: How many centimeters or inches is it supposed to rain today? 0.0in – 0.3in: A light drizzle, just a rain jacket will suffice (sometimes I’m stubborn and even go rain-jacket-less, but that’s just me. Like I said, I’ll always have it handy regardless). 0.3in – 1in: Depending on what hours percent-chance is highest, this could be a getting soaked situation. If it rains 1in in the course of one hour, that’s very heavy rainfall. If it rains 1in over the course of a whole day, that’s more of manageable-medium rainfall. These are the things I pay attention to so that I am prepared for my ride. 1in-4in+: This is more of a flash-flood situation, be prepared to be soaked. Fenders are essential, unless you are a fan of mud stripes down your back. Depending on your commuting situation, you may also consider upgrading to all-weather brake pads, upgrading to wider tires with more grip, or covering your bike up if you park it outside to prevent excess wear. Come by the shop and we’ll be more than happy to help you get set up for year-round riding and turn that frowny commute upside-down. Plus, if you come in before December 31st, all our accessories are 25% off, so you’ll save on your lights, fenders and other gear! Bike Theft- What You Can Do To Not Become A Statistic. Most cyclist have a special relationship with their steed- giving it a cute yet meaningful name, buying it little gifts like a cool new bell, etc… In essence, your bike is an extension of yourself (or at the very least, on the same level as a beloved pet). This is why bike theft is such a horrible, gut-wrenching experience for the unfortunate ones who suffer this egregious transgression… Unfortunately, the only 100% way to protect your baby is to never let it out of your sight, but that is hardly feasible given the size of most apartment bathrooms… There are things that you can do, however, to protect and deter and lessen your chances of becoming a statistic. Locally sourced… from a volcano. 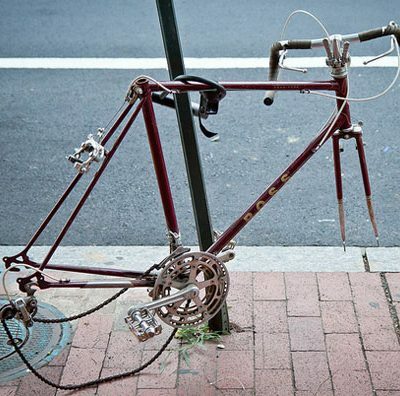 At Cycle Portland we stock all of the accessories you need to help you avoid bike theft. First and foremost, you need a high quality U-lock that is big enough for you to easily secure your frame, but not so big that a thief could use a tool to pry it open. 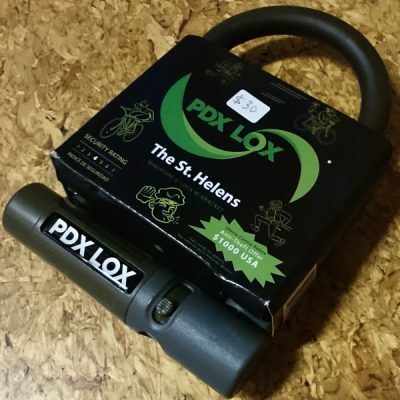 We carry U-locks by Kryptonite and PDX Lox. Both are more that adequate to secure your steed! We are happy to help find the right size lock for your bike and walk through some best practices with you. On a side note, we DO NOT recommend using a cable lock for bike theft prevention; they are easily cut with the most basic bolt cutters. 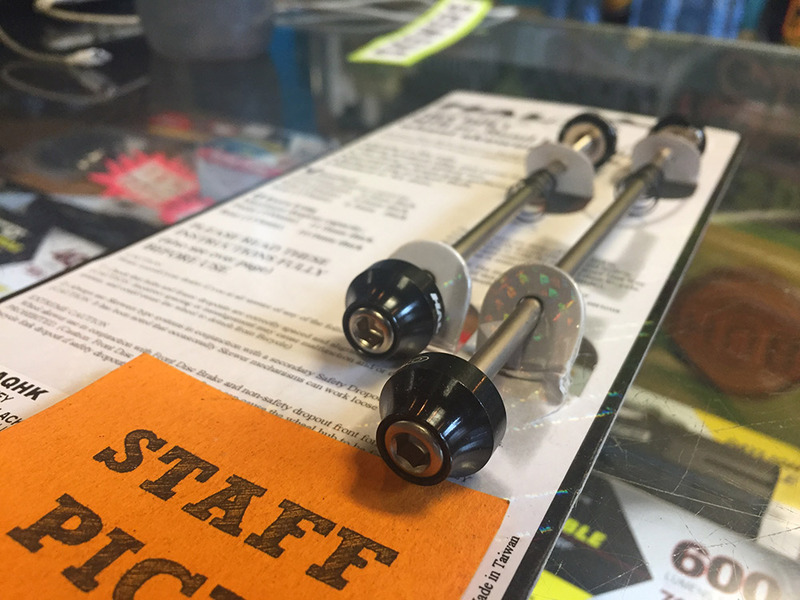 For your wheels, the component we see most commonly stolen, we highly recommend locking skewers to secure your “go-discs” to your frame. Pin-Head Anti-Theft Skewers are uniquely keyed and provide the best wheel protection. 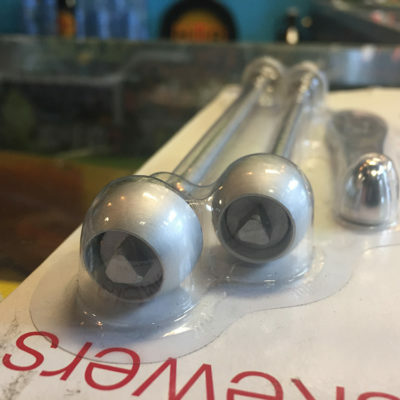 There are other locking skewers available that use either a specific key or a hex wrench to removed the wheel which also work well, but Pin-Head provides the greatest piece of mind. You should secure other parts of your bike as well, depending on the value you place on them (both actual and sentimental). Basically, if it is not welded to your frame, a thief given enough time and opportunity will steal it. Locking headset caps, locking seatpost collars, and saddle leashes are also great tools to secure the littler bits. Head over to our friends at Bike Portland for more suggestions and a more complete list of precautions to keep your baby safe from bike theft! If you have more questions, stop on by the shop today and ask one of our helpful employees for advice on which security options will work best for you and your bike. After all, it’s your baby and no one likes it when babies are stolen. 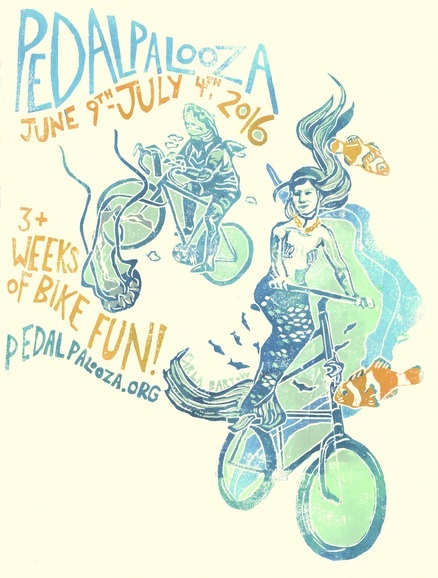 The 14th annual Pedalpalooza is in full-swing, with 250+ group rides already scheduled. This year, the fun will be going on until July 4th. You can find the 2016 schedule here on Shift2Bikes, and below are some highlighted rides. We all wish we could make it to every single one, but our legs (and schedules) can only take so much. Many of the popular rides below have pre-rides that meet up with them, so check the schedule and see how many you can fit into your month of June! Come out and join the fun, we hope to see you there! Our bikes are vulnerable companions! Every part and piece is quick release, always ready to be liberated. We are forced to leave bikes out on the street all day (and occasionally, all night). So you ask, “How should I best prepare my bike to be left outside?” Well, we’ve got Mechanic Mike here to tell you his favorite approaches to theft-proof and secure his bike components and accessories when he doesn’t have the option to store it safely inside. He is going to tell you about his favorite products and tricks to keep your wheels, lights, computers and saddles from disappearing into the night. We regularly hear from disappointed bike-owners down here in Downtown Portland–a city known for its risky bicycle environment. Wheels are the most expensive part that might wander away while your bike frame is properly locked to a bike rack. We will start with ways to make sure you’ll be able to roll home after work, after dinner or after your night out. Hub locks are a great option for securing your wheels around town. There are a few brands that we carry here at Cycle Portland depending on your budget and desired security. The Pinhead Security Pack is an option with individualized keys for the highest level of protection. Like your house or Kryptonite key, this unique key offers the most security for your wheelset. 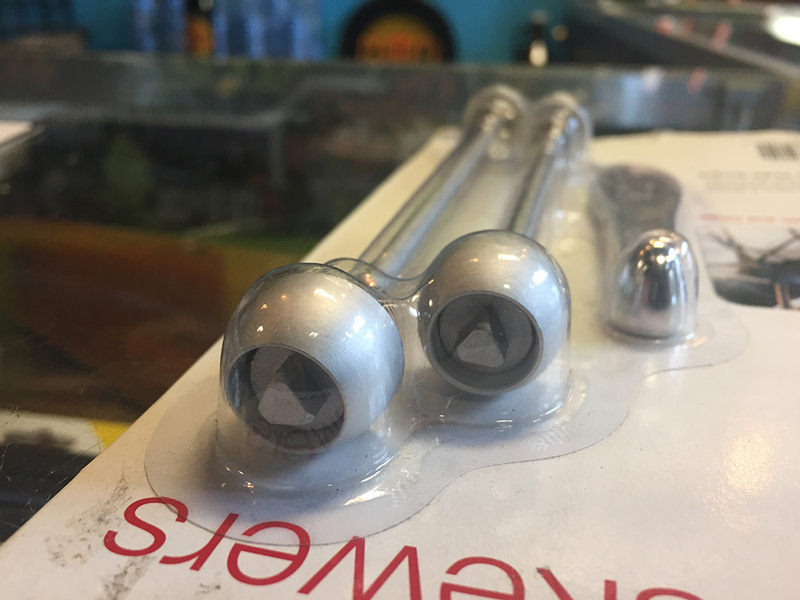 A pair of Pinhead security skewers will cost you a bit more than $50, but give you the most confidence that someone isn’t working your wheels loose while you’re at work. So if you often lock up outside in theft prone areas or just want to protect those hand-built wheels, we would be happy to install these on your steed today. HubLox offers a pair of anti-theft skewers that utilize a specialized key shared with all other HubLox. This means that a thief would have to be carrying a specialized HubLox key to take your wheel (unlikely, but possible.) Much easier to get ahold of than your individual Pinhead key, but still offering a pretty good confidence that your bike is secure. No one is going to remove these skewers with an adjustable wrench. Just make sure your shop has a copy of the key for any repair that might require they remove the wheels. Halo Hex Bolt Skewers are Mike’s personal favorite for keeping our rental single speed bikes safe. These can be installed with a simple hex bolt meaning you don’t have to remember to take your hub lock key with you in case of a flat fix. This works best if you want a deterrent so that a thief can’t grab and go with your new wheels. DIY Trick: this one will be useful for a number of different parts of your bike. Often, simply adding a hex wrench controlled skewer won’t keep your wheels from wandering off during the day. A DIY trick that Mike is particularly fond of is adding another obstacle to prevent easy removal of the wheel. Using a bit of glue to keep a ball bearing in a hex bolt opening prevents any tampering with your Halo Skewers, stem, seatpost clamp, etc. A cheap additional level of security that can be undone with a bit of heat or muscle. A stolen bike seat can be a hassle and usually expensive to replace. Below are a couple of the many ways you can theft proof your saddle. Cable: Planet Bike, ABUS, and OnGuard all produce a dedicated “seat leash”, a thin cable designed to be used with a separate lock to secure the rails of your bike seat to the frame. These leashes are relatively cheap (~$5-10) but must be paired with another lock to theft-proof your seat. DIY Trick: Here is an idea: use an old chain inside a bike tube. If you have an old chain lying around (or want Mike to do it for you), this is a great use of it and a cheap, cut-resistant alternative to a seat leash. Accessories are the most stolen equipment for most bicyclists. It is almost a right of passage for new commuters to lose a set or two of lights before they find a way to secure or remove their accessories. Hopefully you got a chance to read this before you lost your first set. Mike doesn’t like to remove his lights every stop so he has found a few DIY ways to keep his lights securely attached. Here are a couple ways to secure your accessories with the least amount of energy and money. Take Them with you: The safest option is always to take your accessories with you whenever you leave your bike unattended. Make a habit of grabbing everything off your bike whenever you lock up and use the chance to charge your USB powered rechargeable lights and bike computer. DIY Trick: Cut your tabs! One way to slow down a would-be thief is to cut the quick-release tabs off of your light mounts. With this trick, you can leave your lights on the bike for quick stops as it makes removing the lights a much slower process requiring a screwdriver or pocketknife. Its wet out there! Riding in the rain is just part of the Portland biking experience. Proper bike care during the rainy season makes it all the more fun to get out there and mash in a rain shower. Mike will tell you, “A squeaky chain won’t do you any favors.” The most important part of wet riding maintenance is properly cleaning and oiling your chain. Mud and road debris that find their way onto your chain often cause shifting issues, noise and other performance issues. A dirty chain causes pre-mature wear on your entire drive train; neglecting a dirty chain can end up costing you money when you have to replace your chainrings, pulleys and cassette. This is a chain that hasn’t been maintained, rusty from rain and Mike is going to take us through the process of cleaning and re-lubing. Just as it is important not to leave your bike out in the rain for too long it is important to dry off water once inside as water left on the chain rusts. During the PNW winter, Mike recommends cleaning and oiling your chain at least once a week. Cleaning your chain is quick and simple with the right tools. First, clean the chain, you can degrease with a citrus-based cleaner such as Finish Line Citrus Chain Degreaser, and scrub with a rag. It’s really important to get all of the degreaser off before applying the oil. Mikes favorite chain oil in the shop is Tri-Flow. It is really important to use a rag to remove all excess oil after applying. Excess oil when it dries can become chunky and attract debris to your chain. We always have a basic selection of degreasers, cleaning tools and oils for chain/ bike maintenance at Cycle Portland. We are happy to provide what you need for regular DIY bike maintenance. If you would rather have a professional maintain your bike, Mike is always happy to check out your ride and is in the shop Monday through Friday. Cycle Portland offers free estimates and same day service for most maintenance and repairs. Cleaning and oiling the chain is included in our $30 Safety Tune where Mike will also inspect/ adjust your gears, brakes and wheels/rims for proper functioning and performance. Have a safe, well-oiled ride in the rain and hope we see you and your bike soon at Cycle Portland! And check out the column next week when we talk about the best brake pads and braking systems for riding in wet weather! This article brought to you by our resident art expert and tour guide extraordinaire Melissa – thanks! The mural festival’s name comes from the phrase you can’t see the forest for the trees, which signifies the inability to understand the greater picture when you’re too focused solely on what’s in front of you. Forest For The Trees hopes to pull Portland’s residents away from their daily routines and provides them a moment of appreciation for the creativity that surrounds us in the Pacific Northwest. Check below to see some of the best murals of Portland we discovered during the ride!